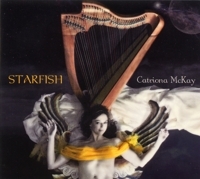 Catriona McKay - Scottish harp and Starfish McKay harp joined by Donald Grant - fiddle; Fionan 'Fionomenal' De Barra - guitar; Matt Baker - double bass; Alistair MacDonald - laptop wizardry; Seamus Egan - nylon guitar on track 9 & Red Skies - strings. This piece celebrates the new Starfish McKay harp. I collaborated with Starfish Designs in North Ballachulish, Scotland, to create a modern harp with amazing new possibilities. The harp has a unique tuning pattern and I'm mad about it! Find out more on my website. Brian Finnegan composed Forest Baby for his little niece Frida, the daughter of his anthropologist sister Morna who lived for a time in the Congo with a tribe of forest dwellers.Brian describes her as "a little miracle girl with the soul of a pygmy." A few trips to perform in Japan have allowed me to develop a love of green tea. I thought of this title having played The Greenland Man's tune for many years with fiddler Chris Stout, which we recorded on our duo CD Laebrack. This was written in 1999 when as part of Fiddlers' Bid I raced in the Cuty Sark Tall Ships Race onboard the Swan LK243, built in Shetland in 1900. We were sailing as crew and musicians. The melody came to me when we were on deck having a tune whilst sailing by the south tip of Shetland in the low, warm coloured evening sun. It was almost as though the wooden deck of the Swan became an extended soundboard for the harp and it was a magical moment I wanted to keep with me. This tune has gone on to take it's own journey and has been played and recorded by wonderful musicians including Alasdair MacCuish, Fiddler's Bid, All Jigged Out and The Aquarelle Guitar Quartet. Inspired by the travels of the courageous and inspirational sailor Ellen MacArthur. The title refers to the meeting point of the South Atlantic and the Indian Ocean. I was performing at the Celtic Colours International Festival 2006 with Gaelic singer Mairi MacInnes, when I discovered the shell of a sand dollar on a beach in Cape Breton. Brian Finnegan wrote Little Impulse in the winter of 1994 whilst living in the beautiful and mysterious city of Budapest. He'd taken time out from playing music, but the heartbeat of Budapest plugged him back into life. The phrase Aval Moon is used to describe the moon when it's resting on its back. I' ve been working with Alistair MacDonald for several years, exploring harp with his laptop wizardry. I first saw mareel (photosphorescence) when onboard the Swan LK243.